Have You Got The Wrong People On Your Bus? One of the things I run into when I coach Dental Offices is team members who don’t want to be coached on Customer Service. are two of the *common excuses* that I hear from team members who simply do not want to improve on what’s going on in their Dental Office. are another two of the *classic excuses* offered up by the stick in the mud team members, who don’t want to entertain the thought that what they’ve been dishing up to their patients on behalf of their office is anywhere short of inadequate or ineffective. I guess I’ve been polite to this point in calling these dissenters “team” members because really by the way they’ve spoken so closed-mindedly and expressed their disagreement so publicly to the direction their Dentist has wanted to take the practice that they really are not eligible to be entitled to call themselves members at all. Really, by virtue of the fact that they have been so averse to the direction that their boss has wanted the practice to go, their behaviour has been more typical of mutiny. Because the aim of the team is to support the decisions of the owner. Especially when the evidence that the owner presents is that there does exist a better way. The problem for the dissenters is that this new way requires change. And these dissenters will do anything within their power to maintain the status quo, no matter how economically unstable the current status quo in their Dental Office is. All to protect their “comfortable” piece of turf. Because change to something new requires effort. And most of the time the disdained know that a little squawking now can be quite effective in avoiding the pain of change, and of having to learn new skills, or speak more pleasantly, or dare I say, think outside the box. I’ve seen the introduction of new systems and new tracking arrangements met with ferocious hostility from those disdainers who dread accountability. When really the opportunity to learn new skills, to make ones self better at what one does should be motivation enough to embrace change and move forward with inspiration. I’ve coached teams that have embraced change and tried different ways because their minds were *NOT* mediocre. Just last week one of my clients in Pennsylvania in his sixties had thanked me for getting him to “think outside the box”. When you free those mediocre minds off your bus. It’s important when hiring people to work in your office that the people you choose have the correct aptitude and attitude to serve your organisation the way it needs to be served. Choose people who do care to be on your team. Choose people who reflect you, and your care, and your vision. They’ll try their hardest to drag you down to their level. And that’s not a good place to be…. The Answers To Running A Successful Business Are Right Out There Before Your Very Eyes. It is said that if you have a business that’s not meeting your expectations then the chances are you haven’t found the right answers yet. The answer is that you’ve probably heard the information you need to create a successful business. You may have even heard the information and written it down. Your problem is that you most probably haven’t taken the *ACTION* you need to take to create that success you are wanting. In fact, you may not have ever done anything that might have moved you one millimetre towards improving your business. You see, that’s because thought without action is useless. Thinking about doing something, and yet not doing anything at all, well that’s a waste of time. You may as well think nothing at all, or think about fluff. It is only through action and the right action that we will achieve greatness. Some people are concerned that their action may take them in the wrong direction. But if the action takes you in the wrong direction it’s a lot easier to turn around and change direction than it is to try to start again from stationary. ”David, we’ve heard ninety five percent of this before. The problem is we’re not doing most of it”. Failing to act is leading us to failure. It’s stopping us dead in our tracks. And we settle back into the same-same routine. That routine that hasn’t worked. That isn’t working as best it could…. If you had money in the bank, would you just leave it sit at whatever interest rate the bank gave you? Or would you see if maybe you could move it to a better interest rate somewhere else? Of course you’d move it! Because leaving it just where it is is costing you money. Yet that’s what you’re doing with your business! You’re leaving it just where it is…. And its’ costing you money. Of course, you need to take action. Write it down, and chunk it down into pieces. A lily that doubles its size every day is only covering half the pond the day before it reaches its goal. And it’s covering a lot less of the pond in the early days. Little things done now result in big things later on. But nothing done now results in big losses later on. Secondly, work out what you need to do to reach those destinations you are looking for? If you want a one million dollar a year of collections, what do you have to do on a monthly, on a weekly and on a daily basis to achieve that income goal? When you chunk it down into daily and even hourly goals achieving the big numbers becomes less and less of an issue. You just need to maintain your consistency and persistence once you know exactly what you need to do. And that’s the third thing: Consistency. Doing the right things on a regular basis is what gets you from A to B. Last Sunday, as I was walking from my car to the football ground, I passed three people who were walking a little slower. And as I passed them, I overheard one say to one of the others that he was so going to win the lotto, as a solution to his problems. And one of the others then remarked that that was also her father’s plan as well. Which means that they both did not really have a plan, except hope. As a plan, it’s pretty useless. Small incremental savings would go a long way towards helping these people a lot more than hoping for a lotto win. Is it to simply “hope” that things will fall into place? Or do you have a serious Action plan? You need to be taking action. The highways of the world are littered with the remains of stationary animals that failed to get moving. “The truth is there are no secrets to success … just books you have not read yet …” – Brad Sugars. We Can All Learn From Other Industries. Yesterday I went to watch the Rugby League. Which is way out west in Sydney. It’s kind of like Dodge City. It’s a long story, but my mother’s father, my grandfather, retired into Penrith, so as young men my brother and I used to go to the footy with him. And I’ve kept going ever since. In fact I’ve been a season ticket holder at Penrith since 1978. So today I headed out for the afternoon to watch the Panthers play. It’s an expedition. You see we live a good hour’s drive and some sixty kilometres from the Panthers’ home ground. What surprised me today when I went out to watch the Penrith Panthers play the Gold Coast Titans was that the Panthers Club had taken a leaf out of another industry’s book, when it comes to Customer Service. And what was nice about what they’d done was that to me, as a Customer Service Aficionado, was that it was unexpected, and yet very welcomed. At the entrance gate today for members [season ticket holders] there was a red carpeted and roped off area for the members to enter separately from the other match attendees. Kind of like the Priority Line for airline travellers who travel up the pointy end of the plane. And to me this was very pleasant recognition. And it felt nice, and it felt special, just to walk the Red Carpet and to have the special entrance. And not to have to line up. The bag search on security seemed a little more relaxed than usual in this entrance, kind of like the way that TSA Pre-Check Approval allows you to fly in the USA without having to take out your laptop and without having to remove your shoes. Once at the entrance gate I was greeted by a lady with a handheld scanner who scanned my season ticket barcode [which was on a lanyard around my neck] and I was on my way and in. What was so different here was that at the other gates there were fixed scanners that were used for scanning hand held tickets but were really awkward to maneuver to for those who wore the lanyards. So how simple was that then to solve the problem of being a contortionist, that previously existed? Now I’m not sure if the Penrith Panthers team “borrowed” these two ideas from another Rugby league club, or from the soccer or from the Australian Rules Football. What mattered most to me was that they had borrowed these ideas from somewhere and had brought them to Penrith where they’d been sadly missing before. Now the question needs to be asked are these “red carpet” procedures being wasted on the common working folk of Penrith? Are the regular followers of the Panthers being spoilt in this instance? For me, the answer is “No”. For me, every little bit of extra makes for me to feel special. Mary Kaye Ash said it best. Today at Pepper Stadium, home of the Panthers, as a member, as a long time supporter, I was made to feel important. What are you doing differently in your Dental Office that your patients and customers will notice compared to last time they were in? Where’s your version of the barcode scanner? Are your patients having to play contortionist in an effort to jump through your dental hoops? And where’s your red carpet? Are your patients feeling the warmth and the love from you? Are your patients being made to feel that red carpet experience? If a fifty-year-old football team can make their fans and their players feel special in these more difficult times, then ask yourself this then? Ask yourself what sort of services will you allow to make your service more enjoyable, and more entertaining for your clients and for your team members? 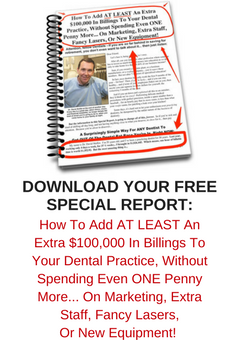 You see, sometimes I talk to Dentists about rolling out the red carpet for some of their best clients, and there are dentists who are fearful that doing this may cause their practices to lose patients. At the football I felt honoured and pleased to be considered worthy of a lift in the service with a red carpet. And in business, if any customer does change merchants because they’ve been made to feel special, then they’ve really proven that they were thought to be in the top twenty percent of that business’s customers under false pretenses. There’s no reason why we shouldn’t pamper our best clients. Our best clients accept treatment more readily, schedule it, and keep the appointments. Treating these clients better encourages more of these better behaviours. Our regular clients, our back of the plane fliers know that without the people in the pointy end, there’d be a broad increase in fares to compensate for their absence. It’s the same at the footy. The long term regulars are there as the backbone of the fan base. They’re stumping up for a ticket for every game, no matter what, at the start of the season. That’s a huge emotional AND financial commitment from the die-hard fans. In the same way, our long-term dental patients are there as the backbone of our patient base. They trust us, they book ahead for their preventive services, and they willingly refer. They are our saving graces. Without the frequent fliers up the front on the airplanes there would be no cheaper travel for those down the back. There would be no low priced coach or economy class tickets. The price of coach and economy would rise to compensate for the loss of first class ticket income. In life, there’ll always be twenty five to thirty percent of the population who will be loyal to their supplier of certain services despite what those suppliers charge. So long as those customers receive great service, the price will not be relevant. Be it lawn-mowing, fingernails, hairdressing or dinner. If we get a good product and great service, then we’re fans! In this instance, our instance, Dentistry should be no different. Provided we can keep up the service. Provided we can keep up that red-carpet service our patients should keep coming back in droves. If your patients are not returning, then look at your deliverables. What are you NOT doing for them? Where are you just doing same-same as all the others? Where have you failed to deliver on your point of difference? So many dentists just do what all their fellow dentists do and then they wonder why they don’t have a point of difference. Like with insurance, or health funds? If you go to a new town and want to know how to get ahead in business, see what everybody else in town is doing, and simply just do the opposite. If you aren’t achieving the results you want with your business then maybe it is indeed time to start looking at doing things differently. Trouble is, too many businesses look at their competitors and what they’re doing and start doing those same things, when really they should be looking at doing things differently. In the early nineties, when health fund dentistry came to my town, and two major insurers set up member clinics within three hundred metres of my Dental Office, all of my competitors were running around thinking that the sky was falling in. What I did was I used this misuse of market power to turn my Dental Practice around and turn the most overused dental paradigm on its ear. While my neighbours were worried about how they were going to compete against member only dental clinics I started looking at my Dental Office and asked myself if I was a dental patient what would I want? I built a place where patients came and were made to feel like a person and not like a number. I built a dental practice where patients could arrive as early as they want and stay as long as they wanted after treatment, where the visit to our office was like visiting the home of a friend rather than the traditional open wide and drill ‘em, fill ‘em and bill ‘em. Walt Disney built Disneyland on the same principle. And there’s no disputing that Disneyland and Walt Disney World are not the cheapest amusement parks about. But they are the gold standard in Service. Everywhere you look there are businesses that dared to be different by taking the road less travelled, or by taking a completely different road all together. Henry Ford said that if he’d listened to what the people wanted he’d have tried to build a faster horse. Instead he dared to be different and innovative and built the Model T Ford. In 2004 while everybody else was building upstands on reception desks I took a chainsaw to mine and destroyed it, preferring private glass walled offices for my patients to be greeted and farewelled in. Glass walled rooms that allowed total transparency and yet had total privacy, so patients could discuss their treatment and their finances in private, rather than in a room that resembled the barber shop in “Coming To America” with Eddie Murphy. Omer Reed said that ninety five percent of Dentists reaching the age of sixty five are unable to afford to retire. Ninety seven percent of the population do not write down and review their goals. Ninety five percent of people who play golf do not break one hundred. Ninety nine percent of the population don’t have a coach. Taking advice, other than your own, might be in your best interest. When it comes to Customer Service the airlines do a pretty good job. And on most flights there are different types of seating and different “classes” of travel. First Class. Business Class. Economy Class [Americans read: Coach Class]. And yet as far as I’m aware all three of these forms of travel all reach the destination at exactly the same time. So why do some passengers pay the excess cost for the more expensive classes of travel? Is a seat up the front of the plane really that much better? On a long haul flight, wouldn’t it be more economical for the passenger to pay for a Coach or Economy ticket and then have an extra night of accommodation to sleep off the discomfort? Is flying up the pointy end really all its cracked up to be? Is the service really better up that end? And if it is, why is it better for those passengers and not for all passengers? Why shouldn’t all passengers receive the same high level of customer service regardless of their choice of seating allocation? If you had a champion racehorse, would you cram him into a shoebox for sixteen hours of a long haul flight, and expect him to perform at his best once he arrived at his destination? The answer is probably no you would not. No you would not subject your champion to the unnecessary torture of the confined space and also no, you would not expect your champion horse to perform at its best on arrival. So why do we do that to ourselves? The thing about flying up the pointy end of the plane is that there will always be people who want to fly up there and are willing to pay for the service and for the privilege of doing so. And there will always be a percentage of the population who will see value in those seats and are happy to purchase them so long as there is a perceived point of difference. And that’s the same for nearly everything in life. There will always be people who prefer to fancy dine out rather than eat fast food, although both types of food serve the same need [of filling a hunger] and although both types of food will be only a memory some forty eight hours later. Although the fancy dining is an *experience*. There will always be those who prefer to take the bus than to travel by Town Car or chauffeured limousine to a destination. And after all, they all get you to the final destination safely. Yet the limousine ride will be an *experience*. In dentistry, there will always be dentists who are looking to undercut their competition on price as well as on service and quality, in an attempt to “capture” a share of the market. I heard last week of a US dentist who decided to stop seeing Insurance patients, and only would see full paying fee for service patients. And in the first instance what happened was that his collections for his practice dropped by some 40%. Yet in the same time frame that dentist’s net profit rose by 20%, indicating that he was doing a lot of insurance based dentistry at a net loss to his practice. This dentist had confused busy-ness with net profit. And if net profit suffered at the hands of the extra collections, then the practice certainly did need to take a look at the services it was providing, especially if those services were being under-rewarded and were costing the Dental office serious money. In business, it costs no more really to be nice to your customers. And to be more pleasant. And to be polite to them as many times as you can. Rather than to be “adequate” only. The thing about common courtesy these days though is that it’s getting very much like common sense. And that is that it’s not very common. For a business to make it its mantra to be the best that it can be, to be *the* difference in its customers’ days, and in its customers’ lives so much so that they notice and appreciate and go out of their way to make a recommendation and to become a raving fan of that business, well that’s a true point of difference. It’s as easy as the difference between the front and the back of the aeroplane. So why shouldn’t every visitor to your Dental Office experience the best service at all times? Or when we think about it? But at every possible moment during their visit and during each and every interaction they have with our Dental Office? Maybe it’s because it’s like travelling Coach Class? Maybe we’re just herding them in and herding them out of our Dental Office? Is there an advantage to be taken in the market place by providing World Class Service at all times during the dental visit?